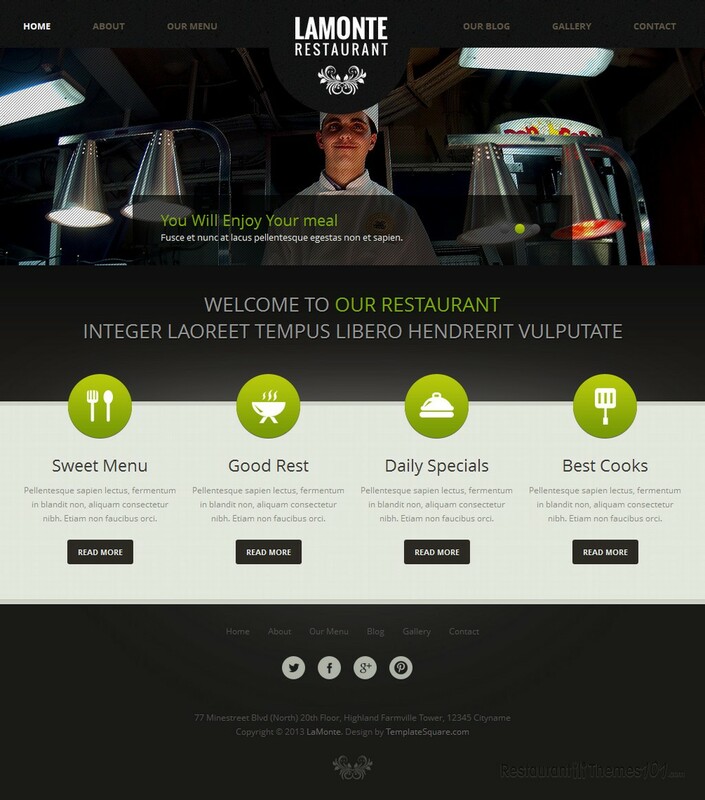 LaMonte is a responsive HTML restaurant template created by Template Square, and featured at the ThemeForest theme marketplace. 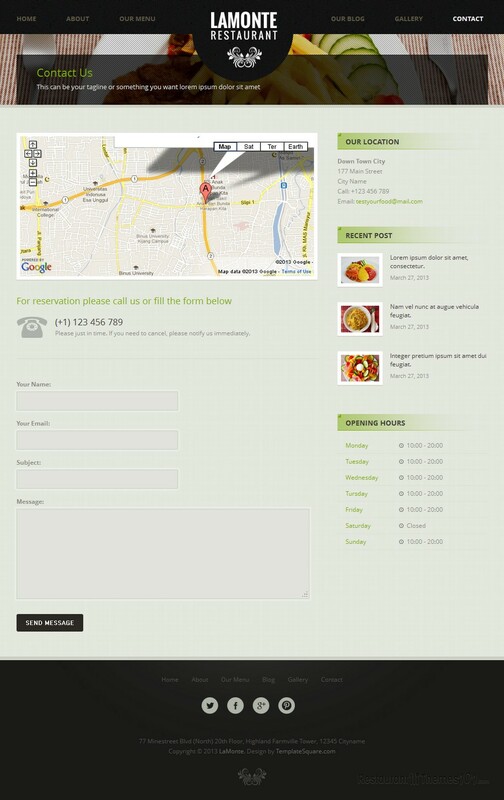 The homepage of this template looks very professional and eye catching. The choice of colors is very compact and it consists of black and white with nice green details. 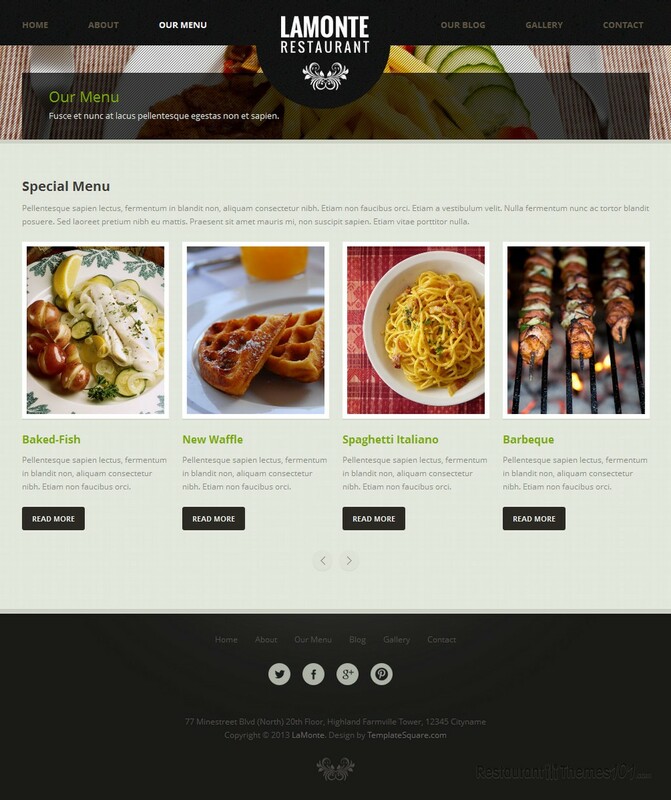 There is a wide, full width slider featured on the homepage and this is a great place for you to post attractive photos of your pleasant restaurant, or the delicacies you offer. The slider will be the first thing everyone sees the second they enter your website, so make sure you enhance it with attractive, quality photos. Underneath the slider, you will find nice icons which represent the featuring of various posts on your homepage. 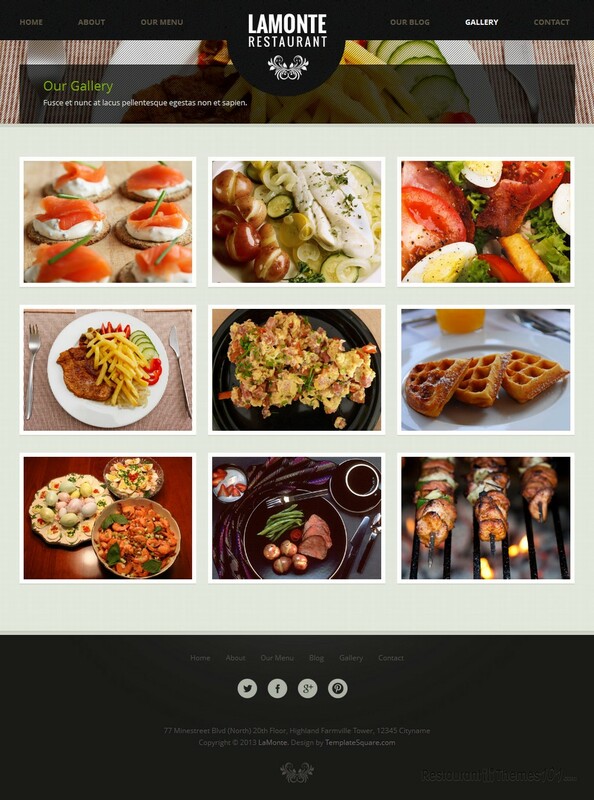 You can feature posts such as sweet menu, good rest, daily specials and best cooks, along with introduction text and a “read more” button. After clicking this button, your visitors will be redirected to the pages of your featured posts, where you can tell them everything you need to, and present your offers to them in detail. The menu is fully functional and it looks very nice. You will be able to create a categorized menu where you can describe your courses in detail, and you will be able to do it very easily. Apart from looking professional and compact, this template features several important options that will make your website very favorable. You will be able to connect your website to the most popular social networks, such as Twitter, Facebook, Google+ and Pinterest. The template features a simple, functional contact form so anyone can message you quickly and easily. It also features Google Maps which will make it possible for your visitors to get exact directions to your restaurant right there on your website. 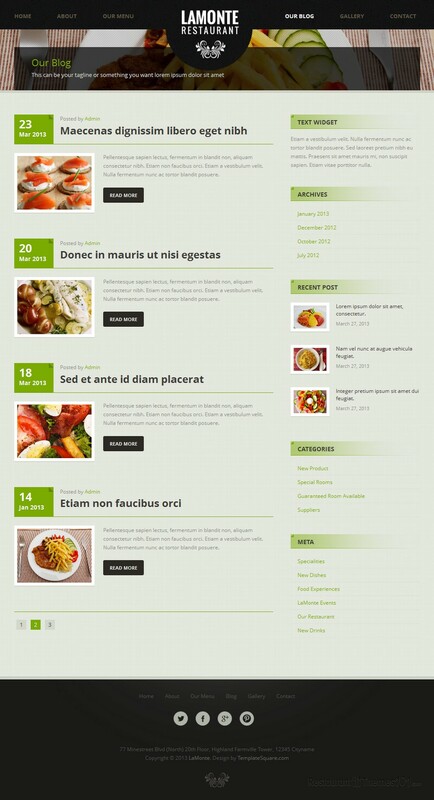 LaMonte can be used as a cafe HTML template, or as a template for any food related business, as it is very adjustable. It is responsive, which means your website will look great regardless of the screen size and resolution it is viewed from. 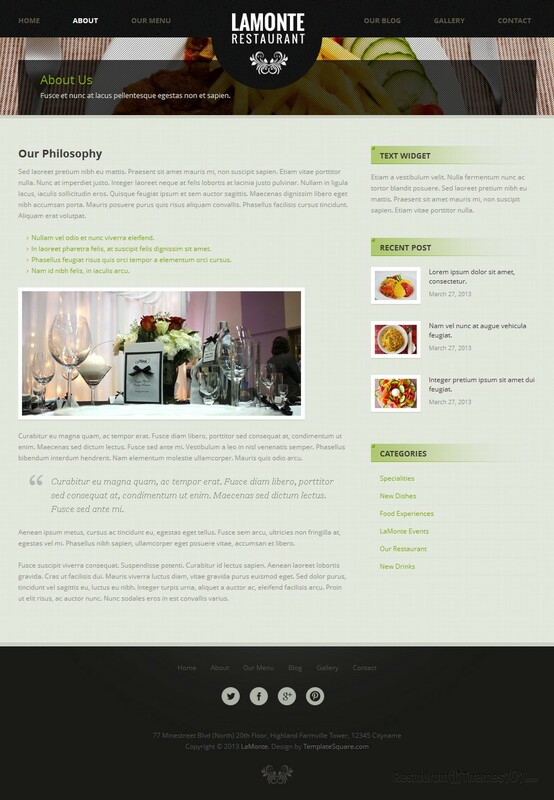 Besides this HTML template you can buy LaMonte also as a WordPress restaurant theme.